Basic knowledge of the factors that lead to the creation of sound waves, their emission in the listening space and to the shape of a speaker's SPL response is necessary if one wishes to understand and use the most important loudspeaker parameters involved in the design process. We do not always need mathematical definitions and complicated formulas to reach and grasp this knowledge. This article is motivated by this idea. -What is it that creates pressure waves in nature? Every solid surface that oscillates ie. vibrates, becomes a sound source. -What feature of source motion does the sound pressure level depend on? a factor of the shape of the baffle that surrounds the acoustic source. -What is the main idea behind a loudspeaker? Loudspeaker diaphragm vibrates as a mass-spring element taught in High School Physics. Diaphragm mass and stiffness provided by suspension-spider form exactly such a system. The spider is the yellow wavy (usually textile) circular element that is glued onto the voice coil and the driver's chassis, acting as a mild spring and exerting a force onto the voice coil. As mentioned in High School Physics spring forces feature a stiffness coefficient.Manufacturer datasheets mention both suspension stiffness and the mass of the diaphragm assembly. -Could we have a real-world example? Let us take the case of a small 4.5'' bass-midrange driver by SEAS the H455 or P11RCY. Its mass-spring system is formed by the mass of the cone/voice-coil (that are glued together) which is 6.5gr and the spider stiffness which is approx. 0.8 Newton per mm of displacement. Engineers prefer using another quantity, the spider's compliance which is simply the inverse of stiffness; 1.25 mm/Newton for the P11RCY. Mass values increase for large diameter woofers. Tweeter domes have a much smaller mass value. -Physics state that mass-spring systems exhibit a resonance effect. How does this apply to a loudspeaker? Diaphragm mass (Mms) and spider compliance (Cms) play their role in controlling the velocity of oscillatory motion at different excitation frequencies being fed by the amplifier connected to the loudspeaker. 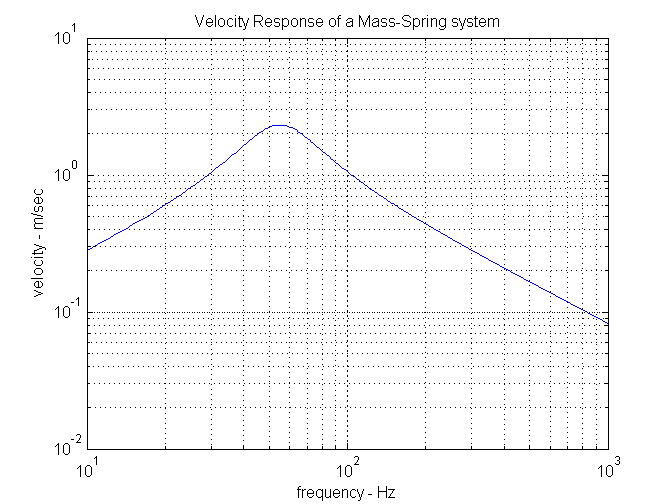 The following figure gives a plot of velocity response of a small mass-spring system. A resonance frequency (fs) is present at mass-spring systems. It divides frequency spectrum into two separate areas. Below fs motion is controlled by spider compliance. Above fs velocity is mass controlled. Let us elaborate on the shape of these two areas: On the left side of the curve decreasing frequency (oscillation becomes slower) lets the 'spring' exert stronger forces and suppress velocity (velocity decreases). On the right side of the curve, as frequency increases the property of inertia that a mass possesses produces a stronger reaction and velocity decreases again. High school physics state that fs =1 / ( 2π√(Mms*Cms) ) ie. resonance frequency is inversely proportional to diaphragm's mass and suspension's compliance. This formula is very important in loudspeakers. Heavy cones create very low resonance frequencies for woofers. The opposite holds for tweeters. A loosely stretched spider gives a low stiffness which means that it features a high compliance coefficient in mm per Newton of force. Such a spider produces a low fs and is suitable for woofers. 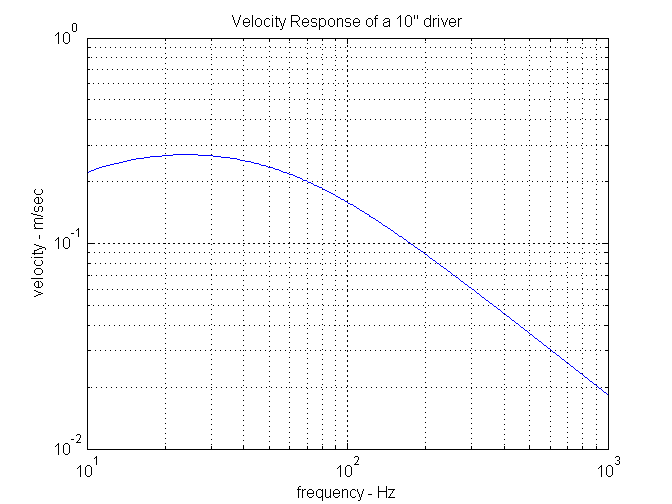 -What determines velocity at resonance? This is a completely different discussion: maximum velocity value at resonance is controlled only by damping that may be present in the system. In mass-spring systems damping is provided by energy-consuming forces created by mechanical resistances. Mechanical resistance (Rms) is expressed in Newton per m/sec. In loudspeakers there are two major sources of damping: the rubber surround (foam in the past) which is attached to woofer cones or tweeter domes and the voice coil electrical resistance. Both of them dissipate energy as heat. A third damping agent is also present, the air around the diaphragm, but its contribution at low frequencies is negligible. 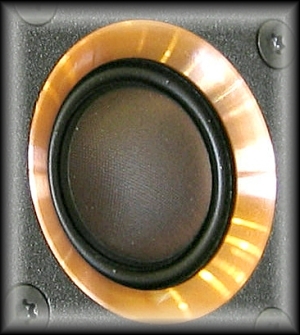 Rubber surround in woofers can furnish a relatively narrow range of mechanical damping (Rms) values : 1.5 to 3.0 N*sec/m. Voice-coil resistance (Rvc) is an electrical quantity not mechanical. Engineers use a special conversion formula to find the equivalent mechanical resistance due to voice-coil. In tweeters magnetic fluid in the gap is also responsible for damping and therefore has its own mechanical resistance value. Generally speaking damping in mass-spring systems controls their stability at resonance. There is a critical value of damping under which oscillation amplitude becomes dangerously high at resonance. That is why such systems are said to be under-damped, critically damped or over-damped. For analysis purposes engineers have defined a quantity directly related to damping and resonance stability for such systems: the Quality factor (Q). The higher the quality factor is, the more instability we have ie. the less damping is available in the system. Quality factor describes resonance purity. In that sense this factor must not be high in loudspeaker devices. When Q=0.707 mechanical resistance present in the system provides critical damping ie. resonance stability is ensured but with a bit of slow system response to external excitations. For values of Q < 0.707 damping is excessive and system response to transients is slow. When Q > 0.707 damping decreases and resonance instability increases. As said before in loudspeakers there are two sources of damping and they have an additive effect. the mechanical quality factor Qms due to rubber surround mechanical resistance Rms, alone. the electrical quality factor Qes due to voice-coil electrical resistance, alone. Loudspeaker manufacturers usually choose a rubber surround capable of producing a mechanical factor Qms in the range 1.00-5.00 and then let the voice-coil resistance to do all the work and control cone resonance through a low value of Qes. The mathematical expression of the total quality factor Qts gives values below the minimum value of the other two quality factors Qms and Qes. For example a tweeter driver having a badly underdamped Qms=2 and an overdamped Qes=0.66 will finally have a very good total Qts=0.50. -How all these combine to produce the familiar shape of a driver's SPL response curve? We said before that pressure is proportional to velocity and frequency. Therefore, multiplying the previously explained velocity curve with frequency yields the following pressure response shape as a function of frequency. These two parameters give a resonance frequency at 24Hz. Qms and Qes for this driver are 3.77 & 0.39 respectively. The overall quality factor is Qts=0.35. Although mechanical quality factor and its damping is poor the overall Qts=0.39 indicates an overdamped system. Resonance curve is not acute. It is now obvious that diaphragm-assembly mass, suspension compliance and the associated resonance frequency determine the shape of a loudspeaker's SPL response. That is why they are very important parameters. We mentioned before that in general pressure is proportional to vibrating area (Sd). So SPL curves elevate as we move to drivers with larger diaphragm areas. The latter are expressed in square cm : cm2. 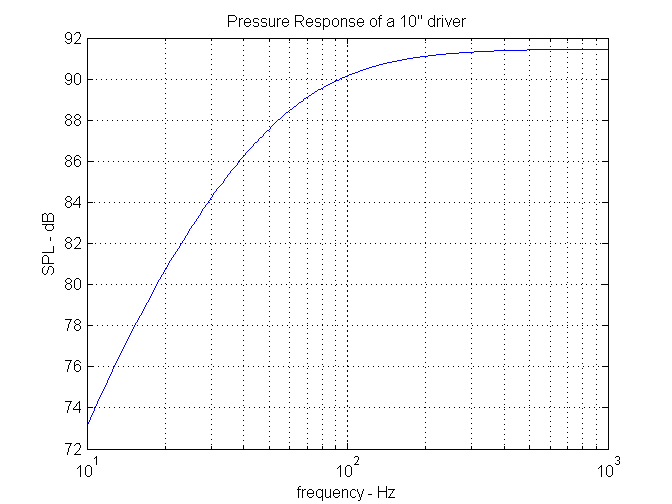 A 10'' woofer has a higher SPL sensitivity value than a 4.5'' woofer-midrange. -So everything is determined by a loudspeaker's parts? No. We focused on the major parts of the mass-spring system just to help our readers get their first course on loudspeaker physics without getting confused. Next section provides a wider picture.